The first time I've read about this plant in January this year, when I got the bulb as a gift. The large bulb was called Ismene festalis (Hymenocallis festalis), unusual flower was depicted in the picture. It's common name is "Spider Lily". I learned that at the top of each flower stalk (height of 45-60 cm) can be up to 6 fragrant white flowers in diameter of 10-15 cm. Minimum temperature for the plant growth is necessary +13 C.
It's necessary to water the plant sparingly before the appearance of green leaves, and watering has to be stopped when the leaves start to wither in the fall. I decided to grow Ismene in the garden container. Ismene comes from the hot and humid subtropics, where drought lasts for two months. They can be grown outdoors from spring to autumn. I put the container in a warm place in my greenhouse, planted bulb in the second half of April. Since early May, the container was standing in a sunny spot of the garden. 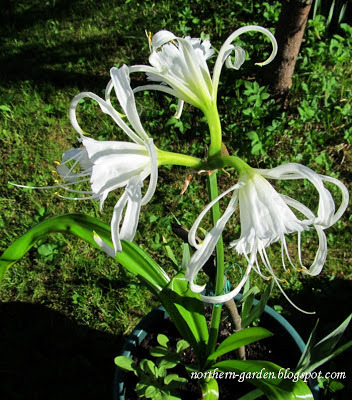 Although it’s written that Ismene usually blooms in the open air in early June, my Ismene bloomed on May 19. The first bud appeared and opened on a high spike. The next day, a second bud opened. It was a miracle! I've never seen such flowers. What reminds you this? Perhaps antennae of the butterfly? And this reminds me of a white swan wings. And these are probably dancing ballerinas, their flowing hands in a dance. However, in early September, I should dig up the bulbs and put Ismene in a pot with slightly damp peat that the roots of bulb would not dry and store it in a cool place. This period of rest is required in order of the plant could bloom again next year. Did you know this plant? Do you grow it in your garden? How do you store Ismene in cold season? This flower was a discovery for me too. Your rainy and cool weather came here as well. We had very sunny days before. I think the sun shines in your sky now. Thank you! Such gorgeous flower!!!! And you made the most beautiful pictures of it! And it's so sunny in your pictures!!!! I really long for some sun over here. It's been cold and windy with rain all the time, and grey, not at all spring weather. From tomorrow, temps will even drop more and go below 10°C. I don't get this weather anymore. Feels like we're living in a bubble and the sun can't get through. I really enjoyed your beautiful pictures of this extraordinary flower I had never heard of. The spring is unpredictable this year! We've had lots some sunny weeks this May, but today is the first cool +12C day and rain all day. I think we'll finally have nice summer on our Baltic sea! Hi Nadezda, I have grown Ismene once before, they came up with those beautiful flowers, but there was no instructions about taking the bulbs up in the winter for growing here in Britain so I left them in the ground. They didn't come up the next year, the bulbs had rotted in the ground. I have nowhere to store bulbs in the winter so Ismene is not for me, even though it has beautiful flowers! Helene, this is a big problem with storing of tropical plants, as gladioli, crown anemone, calla, canna, etc. I have all of them and plus Ismene now. I love Ismene beautiful scent and will try to store them all in cool place, but every year it's more difficult. No conocía esta preciosa flor. Los macros son espectaculares.Gracias Nadezda por por compartir por dentro y por fuera, toda su belleza . Yo trataba de mostrar esta flor tan dulce y extrana. Gracias, laura.M! It's beautiful! I have not heard of that plant either. If it's a tropical bulb I'd guess you have to dig it up and store in sand for the winter. The flower is so lovely, it would be worth growing even as an annual. Rebecca, I think to store it the same way, in moist sand and peat.Thank you for your advice! The bulbs are very fragile and must be stowed for the winter. I love your words: like a bird of paradise! Very unusual flower. Thank you, Lucia! So beautiful your swan wings and graceful dancers! I grew this once in a pot and loved the fragrance but forgot to bring the pot inside for the winter and it perished. Peter, I promise not to forget to put Ismene inside in cool place, because the Jack frost in strong here. Jack, I haven't read your post about Ismene, will look for in your archives. Is it the white or another color? A very interesting flower. I have not heard of it before but I asked AGA and he has heard of it. It smells of Lily of the Valley? That is a very nice scent so I am going to make a note of this flower for when we finally have our own garden! My favourite lily is lilium candidum. It also has a wonderful scent. Kirk, the scent is wonderful, I love Lily candidum, and had it in my garden but it didn't come in the next spring, I had to dig it and store inside. The way I need to store Ismene. Such a beautiful flower! Your photos of it are just gorgeous. And I loved your description of it being like a dancing ballerina. I have never grown this plant before, but I hope you have good luck with it. I do hope too, Holley! I was already thinking how beautiful this flower is thanks to your photos, but now you say it smells like lily of the valley - I'm sold! Ha, ha! This flower was discovery and when the second and the third buds opened, it was a very strong scent! Such an extraordinary lily! Beautiful! Happy gardening, Nadezda! I'm glad you had this plant too! Thank you, marijke! What a beautiful flower Nadezda! !I think i can smell it!! !Great photos and wonderful macro shots! Yes, Dimi, Ismene smells lovely! I haven't heard of this flower but it is gorgeous!! .. I wish I could smell it too .. it must be wonderful. It looks like so many different things .. from butterflies .. to swan wings .. very delicate and stunning. It's true, Joy! Every day there are some changes in the garden. this Ismene looks like many things.. I do hope as well, Laurrie. A beautiful plant and beautiful images, Nadezda! Your description reminds me of ballerinas in "Swan Lake." I've never grown this before, so I do hope it continues to do well for you. Yes, I think about ballerines too. Very graceful is. Gorgeous photos! Love your photo always, especially the new top title one*) Is it rose? I have the similar one, "Rosa mulliganii" Have a lovely weekend! I'm glad you liked my new header. It's a blooming blackthorn, the small tree like a plum tree. I planted it 6 years ago and this year it seems will have some berries:)). I saw in wiki about "Rosa mulliganii", the blackthorn is very similar to this rose! Spider lilies are commonly planted here for landscaping, but your version is prettier with the frilly edge. Beautiful captures. Wow, Nadezhda, what an accomplished gardener you are! These flowers look so unusual, and I remember them being very fragrant too. I hope they continue to bloom for you in future. Oh, Masha, I have no such experience in gardening. Now I'm waiting for the second spike of Ismene. 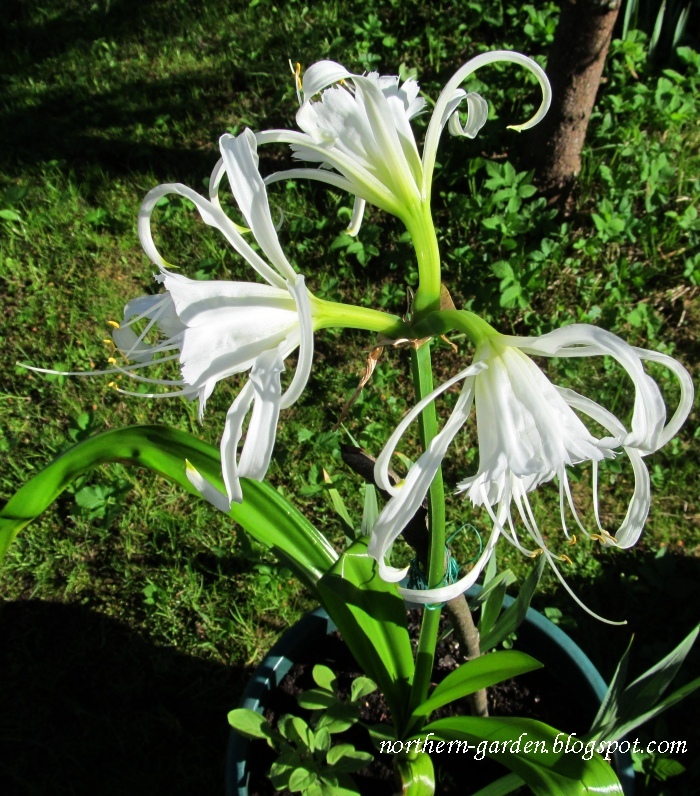 Not that species but I do have a Hymenocallis native to the southeastern US in my garden. It's such a unique and beautiful genus. It's interestingly! So a Hymenocallis isn't only tropical plant, it's native in the Southeastern US. What a beautiful plant! I love those flowers! I really like the jagged edges. It's so much prettier than a regular spider lily. Tammy, I think both - the Ismene and Spider Lily are pretty flowers. What a beautiful flower! I am not familiar with this bulb at all. Your photographs are wonderful Nadezda! What a gorgeous flower!! Your photos show it off beautifully. I have not grown it but now, after seeing yours, would certainly give it a try. I'm glad I tried to grow Ismene, it deserves to be in our gardens. Sadly, not a clue what it is or how best to take care of it, but it is lovely. It looks far too exotic to be hardy !! Thank you for stopping by, Jane! Such a beautiful bloom that I have never seen... glorious! I’ve never heard the name before. It probably wouldn’t survive in the UK. It is stunningly beautiful, take good care of it. Yes, it wouldn't survive in a soil in winter, so I will store it in a pot in winter.